BBE Artist Paul Nelson will be holding a Master Class on August 18, 2013 at Andrew Curries Music and Collectibles in Gravenhurst, Ontario. Don't miss this opportunity to learn the secrets of Blues, Rock, Fusion Scales & Chords and Theory from one of the matsers! Seating is limited so call (705) 687-2117 today and reserve your spot, or visit www.petersplayers.com. Paul Nelson is a member of the legendary Johnny Winter's band and is credited for writing and performing on Winter's Grammy nominated album I'm a Bluesman released on Virgin/EMI for which he penned the title track. He also produced/performed on Winter's latest release Roots on Megaforce/Sony, and performed on The Late Show With David Letterman to promote the release. Highly praised by the industries top guitar magazines including Guitar World, Vintage Guitar and 20th Century Guitar, Paul's solo album LOOK can be found in stores world wide. 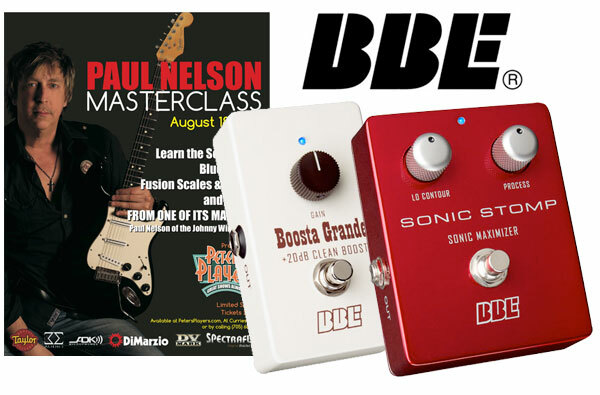 Paul Nelson uses BBE pedals, including the Boosta Grande™ and the Sonic Stomp™. Visit Paul's official website at www.paulnelsonguitar.com.